Petanque hasn’t always been played with the all-metal ball that we’re familiar with today. In fact, such balls were introduced only around 1925. Before then, boules were always made of wood. Sometimes the wooden boules were reinforced with nails. In French, a clou is a nail, so boules cloutées are “nailed balls”. 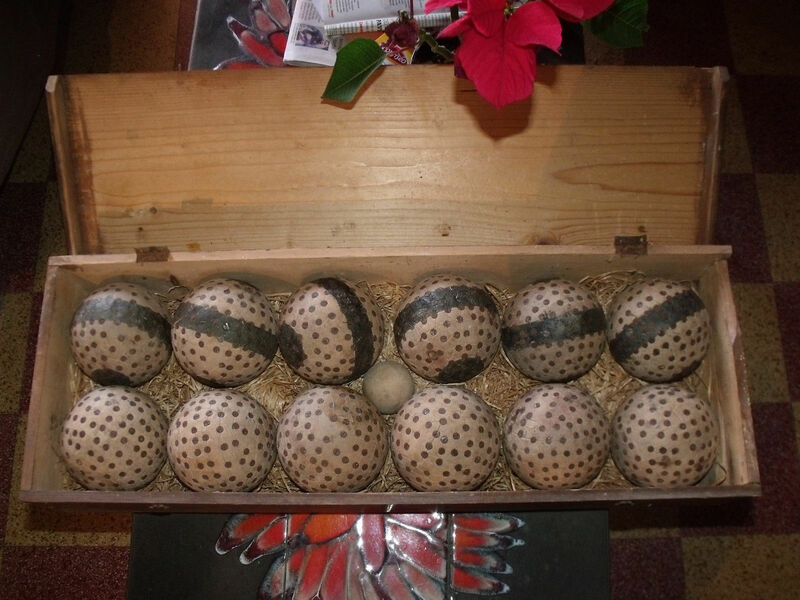 This is the first generation of boules cloutées. Note that the nails don’t cover the surface, but merely reinforce the boules. Click on the image, and then click again, to expand it. Making boules required the wood of the boxwood root, which could be found in the hills of Provençe. There, the sun, heat, and harsh conditions produced stunted boxwood plants, more bush than tree, with very hard roots. The town of Aiguines became famous for its boules d’Aiguines manufactured from boxwood roots from the surrounding hills. The turners would go out to look for boxwood bushes of the right size. When they found one, they would first remove the branches with a pocket knife, and then dig out the roots with a pick (la pitche). The root would be cleaned on the spot in order to reduce the load, and was then carried back to the village. There it was allowed to dry slowly for three years to make sure that that it wouldn’t crack. When it was ready, the wood turners blocked out the shape with a saw, then the rough boule was turned on the lathe to give it the proper spherical shape. At that point it was turned over to the nailers. The nailing (ferrage, from the French word for iron, fer) was done by women. The work required a hammer, a heavy stump of wood to serve as a workbench, and a rond de cepoun — a metal ring which was placed on the stump to hold the boule in position for nailing. A skilled worker could make at most eight or ten boules in a day. 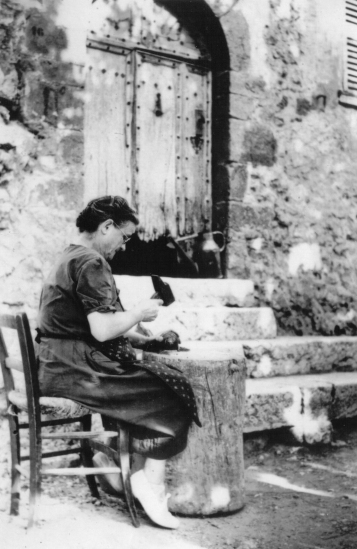 Berthe Rouvier making a nailed boule. Starting about 1850, cheap, plentiful machine-made nails gradually replaced the old hand-forged nails. As nails became cheaper, it became economically feasible for manufacturers to produce more boules cloutées, and to cover them with more and more nails. Eventually the boule cloutée became, in effect, a wooden core supporting a metal shell of nail-heads. Nails of different metals and colors (steel, brass and copper) were used to create a wide variety of designs and patterns. Some of these old boules cloutées are genuine works of art and valued collectors items. The number of boules players in France grew throughout the mid- and late-1800s and right up to World War I. But the growth couldn’t go on forever. The supply of boxwood roots was not unlimited. By the early 1920s the sport of petanque was facing a catastrophic shortage of boxwood roots. Around 1920, a young man living in Lyon named Paul Courtieu, along with his friend Vincent Mille, hit on the idea of creating a ball made entirely of metal. After several years of development work, they were able to manufacture an all-metal boule of a copper-aluminum (“bronze”) alloy — the Boule Intégrale. The all-metal ball had a number of advantages over the boule cloutée. For one thing, balance was an issue that could be dealt with effectively, whereas it had always been difficult to manufacture a well-balanced nailed-wood ball. In addition, metal balls allowed a player to choose the weight of his balls independently of their diameter. In in 1925, La Boule Intégrale was approved for use in official competitions. Two years later Jean Blanc and Louis Tarchier began manufacturing the first steel boules. By 1935, all-metal balls were required in competition play. The days of the boules cloutées rapidly drew to a close. The last boule cloutée was probably manufactured some time in the 1940s. Nailed balls continued to be permitted in competitions until 1959, when the newly renamed Fédération Française de Pétanque et de Jeu Provençal issued rules that required players to use metal boules.